In the inaugural episode of Sklarbro country, Randy and Jason Sklar discuss everything from the movie Annie to black NBA star Amare Soudamire’s claim that he is in fact a Jew. Also in this first episode, the brothers pitch ideas for Yao Ming’s career after the NBA and they talk with Dallas Cowboys owner, Entourage guest star and all around rich guy, Jerry Jones. 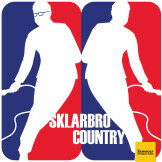 If you like what the Sklar brothers do when they guest host Jim Rome’s radio show, or you are a fan of their show Cheap Seats, or you just like their comedy, you will love this first episode of Sklarbro Country.